Often we're asked, "how will you pose us?" This image is a perfect example of how we avoid active posing and instead work with beautiful light and giving gentle suggestions to the subjects in our images. 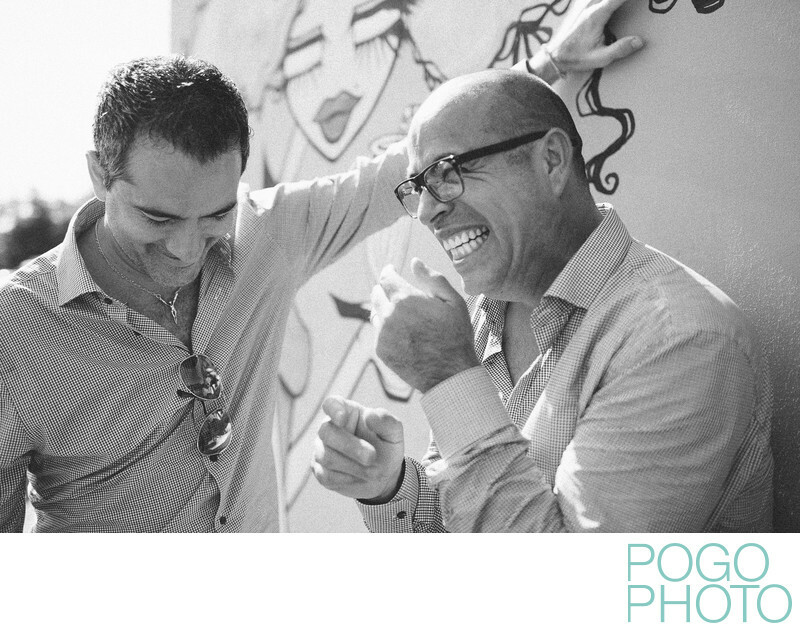 By backing away and not dictating every aspect of the pose we allow your personalities to shine through the images, capturing real smiles and real interactions with each other. (Our biggest recommendation is to relax into your relationship with your partner, and interact like you were on a fun date, ignoring the paparazzi photographers hovering nearby. It’s a bit challenging at first, but we promise, every couple eventually realizes we don’t bite.) Everything from the way Francisco naturally brings his hands up to his face when he’s laughing, to the protective stance Antonio has over his husband, to the way his sunglasses are hung casually from his shirt; all of this was already in the scene, we simply set things up so that this moment could happen with the famous Howley’s mural girl peeking in over their shoulders and the midmorning sunlight beaming from behind them instead of being too squinty with the light in their eyes. Shooting portraits during challenging times of day isn’t as much of a challenge when you have worked in South Florida for as long as we have; although bright sunlight from directly overhead is never ideal, working with backlighting, edge lighting, or even embracing the bright light and shooting for the highlights can bring a fresh and interesting perspective to romantic and natural portraits. Having the photographic skill set to work with bright summer light is necessary in Florida, but is incredibly helpful when we work in other regions as well; it actually makes shooting elsewhere feel “easy”! Location: Howley's, West Palm Beach, Florida. 1/1600; f/2.0; ISO 100; 35.0 mm.